This State-of-the-Art carpet cleaning is commonly mistaken to be a franchise. This business is so well put together with a sharp looking with catchy name and logo design that many think it is a franchise. This is NOT franchise so NO royalties. 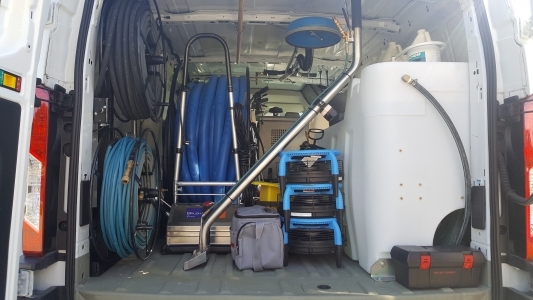 Includes all the pre-vacuuming, spotting, stain removal, and truck-mounted steam cleaning and grooming equipment. One of the best carpet cleaning machines out there. Other services include tile and grout cleaning. PRICE REDUCED for quick Sale!!! (7) If you are really a Go-Getter, this would be an excellent opportunity to make it a franchise. Current owner created this business with his son, who is no longer involved. The father is working a regular full-time job and between this and health issues, doing very little advertising and only operating this business on a part-time basis. Owner is willing to train and advise on how to easily make over $100k in profits. Being a Home-based business equates to low overhead and several tax write off advantages. Selling for family health reason. Business Resource Center can help you become a business owner today!